Sometimes, public administration needs to be about the everyday things at work. The places where we spend so many hours help shape our activities and attitudes. It is sometimes surprising how little thought goes into where and how we work. In the public sector, facilities often consist of four types of space arrangements. “Client public space” is where clients come together in public areas to receive services. A typical model for such space is a big room with a counter. “Client private space” is set up for one-on-one meetings with clients, when needed. “Nonpublic space” is a working area not available to the public. The “no public space” model is used when access for the public is provided online, usually in conjunction with “nonpublic space” where public employees work at computers. Facility design needs to rely on theories that suggest approaches to how space can best be adapted to the situation and on practices that draw from an improved understanding of the issues and options. Design needs to adapt to planned function. The facade and image of a public facility are typically chosen instinctively—not to be too flashy, but not too rundown. But here, too, there is little understanding of how the design of a facility relates to its effectiveness. More adaptive methods of design might have significant impact, if tried. In more recent years, as organizations have become more widely impacted by change, adaptive approaches to administration have been urgently needed. But in many cases, the everyday issues of space and function have not been adequately explored. Even so, many studies have been directed to space design as a topic. Early offices often consisted of rows of desks in a large open space, with a few enclosed offices for managers. 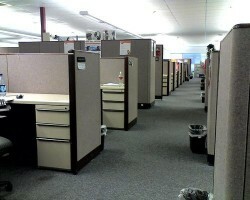 Then, starting in the 1960s, a complicated approach to cubicles was released. However, the more-innovative design of cubicles was rapidly reduced in order to minimize costs, resulting in the stark and standard cubicles of today. There was a better way proposed, but it rapidly went by the wayside. Cubicle elements were reduced to the minimum, and many of the nicer features were jettisoned. The result was the infamous model often seen today in the public and private sectors: rows of identical “squares,” with low or higher walls, often set up without regard to human needs. At a new extreme, some organizations are trying new variations as ways to “improve the situation.” Some offices now have too few desks for the employees, who are expected to spend much of their time elsewhere (in the field). Employees “select a desk” when they are around, but must pick up all traces of presence when they move on. Chairs may be scattered around. With Wi-Fi available, iphones—tablets—and notebooks may be used without a desk at all. Research indicates that some cubicle arrangements may increase productivity and employee communications. However, arrangements may also bring noise and social frustration, along with lighting and ventilation problems. There have been few efforts to understand how operations are affected by facility arrangements. The focus is usually on “cost-per-square-foot.” But this is shortsighted. What is needed is to start with a fundamental understanding of how the organization works and how people fit into the organization. This does not mean complicated math models and simulations. It may more often mean non-quantitatve methods of analysis that involve the purpose of the organization, how people function every day, the values of employees regarding their work space and how all of this affects productivity and effectiveness. There is sometimes too little emphasis on seeking the best way to get the job done and too much emphasis on simple and not very useful numerical indicators. The various types of space discussed above should be evaluated in a comprehensive way, so that a fit is obtained between form, function and people. It may be argued that “adaptive administration” is needed, with design ideas that evolve with the real-world realities. Adaptation to changing settings is needed across-the-board. Clearly, much more needs to be done. The question is not how to apply a generic study from somewhere that comes up with a cost-optimized space design. What is truly needed is the understanding of the organization and environment that can lead to improved performance. It is too bad that such everyday concerns are so little understood as part of overall form and function, as related to organizational specifics and the changes going on at a rapid pace. Like so many issues in public administration, simple questions can often suggest complex answers. Authors: Ferd H. Mitchell and Cheryl C. Mitchell are active in considering how changes in the health care system, due to the Affordable Care Act, continue to require adaptive strategies for almost all health care organizations. More about two books that describe these studies may be found on a special webpage. Universal access and design of the buildings and transportation for the “occupants” of the building highlighted in a massive case study book internationally by Prieser and Ostroff, following the work of the late Ron Mace (father of universal design). Elaine Ostroff also currently operates an inclusive design firm and the University of North Carolina continues its tradition of universal, accessible design which began in the 1970s at the federal levels.